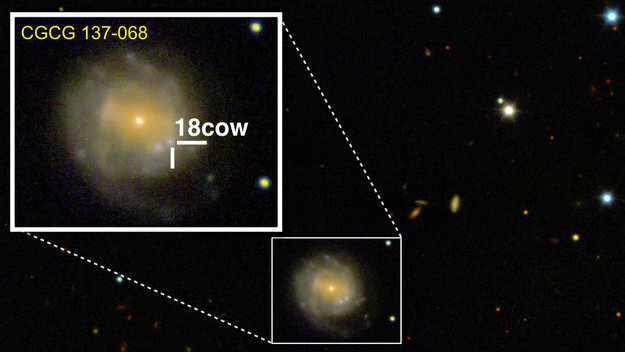 An image of supernova explosion AT2018cow and its host galaxy, CGCG 137-068, which is located some 200 million light years away. The image was obtained on 17 August 2018 using the DEep Imaging and Multi-Object Spectrograph (DEIMOS) on the W. M. Keck Observatory in Hawaii. The ATLAS telescope in Hawaii first spotted the phenomenon, since then named AT2018cow, on 16 June. They soon realised this was something completely new. In only two days the object exceeded the brightness of any previously observed supernova – a powerful explosion of an aging massive star that expels most of its material into the surrounding space, sweeping up the interstellar dust and gases in its vicinity. A new paper, accepted for publication in The Astrophysical Journal, presents the observations from the first 100 days of the object’s existence, covering the entire electromagnetic spectrum of the explosion from radio waves to gamma rays. The analysis, which includes observations from ESA’s Integral and XMM-Newton, as well as NASA’s NuSTAR and Swift space telescopes, found a source of high-energy X-rays sitting deep inside the explosion. “The most exciting interpretation is that we might have seen for the first time the birth of a black hole or a neutron star,” says Raffaella Margutti of Northwestern University, USA, lead author of the paper. 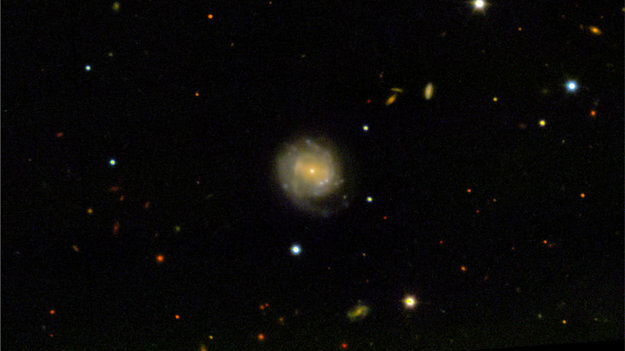 “We know that black holes and neutron stars form when stars collapse and explode as a supernova, but never before have we seen one right at the time of birth,” adds co-author Indrek Vurm of Tartu Observatory, Estonia, who worked on modelling the observations. The AT2018cow explosion was not only 10 to 100 times brighter than any other supernova previously observed: it also reached peak luminosity much faster than any other previously known event – in only a few days compared to the usual two weeks. Integral made its first observations of the phenomenon about five days after it had been reported and kept monitoring it for 17 days. Its data proved crucial for the understanding of the strange object. So while data from NuSTAR revealed the hard X-ray spectrum in great detail, with Integral the astronomers were able to see the spectrum of the source entirely, including its upper limit at soft gamma-ray energies. “This high-energy radiation most likely came from an area of very hot and dense plasma surrounding the source,” adds Carlo Ferrigno, also of the University of Geneva. Because Integral kept monitoring the AT2018cow explosion over a longer period of time, its data was also able to show that the high-energy X-ray signal was gradually fading. Raffaella explains that this high-energy X-ray radiation that went away was the so-called reprocessed radiation – radiation from the source interacting with material ejected by the explosion. As the material travels away from the centre of the explosion, the signal gradually wanes and eventually disappears completely. In this signal, however, the astronomers were able to find patterns typical of an object that draws in matter from its surroundings – either a black hole or a neutron star. “This is the most unusual thing that we have observed in AT2018cow and it’s definitely something unprecedented in the world of explosive transient astronomical events,” says Raffaella. Meanwhile, XMM-Newton looked at this unusual explosion twice over the first 100 days of its existence. It detected the lower-energy part of its X-ray emission, which, according to the astronomers, comes directly from the engine at the core of the explosion. Unlike the high-energy X-rays coming from the surrounding plasma, the lower-energy X-rays from the source are still visible. The astronomers plan to use XMM-Newton to perform a follow-up observation in the future, which will allow them to understand the source’s behaviour over a longer period of time in greater detail.